Newt Survey and Planning Permission: what do I need to know? When would a Great crested newt survey be required? Why does the local planning authority ask for a survey? What does a newt survey involve? There are generally two stages to a Great crested newt survey. The first stage is a scoping survey or also known as a habitat suitability index (HSI). This survey aims to assess the habitat quality. The ecologist will describe the habitat as “Poor”, “Below average”, “Average” or “Excellent”, anything deemed average or above will trigger the second stage. The HSI can not always confirm presence or absence of GCNs. The second stage is a trapping survey or also known as a population survey or presence/absence survey. The surveys are conducted at dusk and dawn. These surveys are conducted between March and June because these are the months when newts are most active and in breeding waterbodies. You will need 4 visits and at least 2 of these visits need to be between mid-April to mid-May. Three survey methods should be used on each survey visit (e.g. torch survey, bottle trapping, egg searching). If Great Crested Newts are discovered, then it may be necessary to carry out a population size class estimate which involve an additional 2 visits in the specified time period. As newts are generally active at night (to avoid predators) all surveys are must be carried out with overnight temperatures above 5c. Can I have a Great crested newt survey at any time of year? The newt survey relating to the habitat can be carried out at any time of year but the presence/absence surveys which focus on the newts are carried out between mid-March and mid-June. How old can the newt survey be? Great crested newt surveys should be no older than 2 years at the time the planning application is submitted. What should I look for when selecting someone to carry out the newt survey? You would need a suitably qualified consultant ecologist. Ideally they should be a member of CIEEM or IEMA. 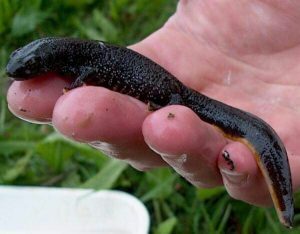 You can ask they have the necessary survey licences (from either Natural Resources Wales or Natural England) to legally undertake the work required as more than likely some of the work will involve the disturbance of newts. Without a licence the surveyor may be judged to be incompetent and so have their report disregarded by the local planning authority. It is always wise to seek several quotes since prices can vary. What is the typical cost of a newt survey? Expect the initial habitat survey (HSI) to cost upwards from £250. This might depend on the number of ponds needed to be surveyed. If GCNs are found, then the second stage may cost upwards from £1500 with a report containing mitigation measures on top that cost approximately £250+. VAT may be chargeable depending on the consultant used. It is wise to obtain a number of quotes since prices vary. This will vary and you should agree this with the consultant ecologist but once all the surveys are complete a report could be completed in a few days depending on the ecologist’s work load. Try to agree this with your consultant as soon as you can. The local planning authority will require the full report that has been prepared by your ecologist that includes the HSI, presence/absence survey results and a mitigation plan that outlines how you will avoid, reduce or manage any negative effects to protected species. Once planning permission is granted you will then need to apply for a EPSL from Natural England or Natural Resources Wales. Are all species of newts going to need mitigation protocols? Great crested newts are the only species in the UK that are afforded full protection as a European Protected Species (EPS). I’ve heard that an eDNA survey will be cheaper for me than having a trapping survey, is this true? It is possible to determine if there are newts by taking a water sample and sending it off for eDNA analysis. The eDNA can still only be carried out between March and June. Ask your ecologist if your local planning authority will accept the eDNA analysis, this can save time and money if you have a long lead-in time to a development. A conventional survey will be required to assess a population size where eDNA results are positive. Charges per pond for analysis could start at approximately £250/pond. If newts are found, what happens next? 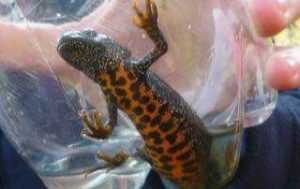 Depending on the results of the newt survey(s), a European Protected Species Licence (EPSL) will be required. This will almost certainly be needed if great crested newts are present and will be affected by the development. This will require an application to either NRW or NE. An ecologist will assist with this process. It is important to note that if Great Crested Newts are found then it is unlikely you will be able to carry out any building works between November and March inclusive. I’ve been told I need to install fencing around the property which is ripe for conversion, can I use any type of fencing? Use approved amphibian fencing (sometimes known as drift fencing) and approved amphibian fencing contractor to install it. This can cost from £4.50/metre. Fencing can be temporary or permanent depending on the project. Generally for small development projects only temporary fencing will be required during building works. You can install fencing yourself but the materials will need to come from a specialist supplier such as Legacy Habitat Management or Wildcare. Who should be responsible on site for looking after the mitigation statement and where should it be kept? The developer should print and keep a copy of the mitigation plan and EPSL on site. NRW or NE may ask to see it during a site visit or audit at any time. A back-up electronic copy should also be stored. If I have Great Crested Newts, how much should I budget for the mitigation protocols? This will depend on the size of site, number of waterbodies, length of newt fencing needed and whether any newts require translocation etc. Small development projects will generally require smaller, less costly mitigation packages. Early consultation with an experienced ecological consultant is recommended. Previous Post Bat Survey and Planning Permission: what do I need to know?